(UPDATED WITH LINK TO REVIEW ON AUG. 10, 2014) Today's blog post is an interview with cult films scholar Frank J. Dello Stritto. For at least two generations, Dello Stritto has published many essays -- in publications such as Photon, Cult Movies Magazine and Scarlett -- on the monster boomer films that defined childhood for so many fans on the cult films genre today. Dello Stritto is also an expert on the life of the best screen vampire, Bela Lugosi. He is the author of a collection of essays, "A Curious Volume of Forgotten Lore," and co-author, with Andi Brooks, of "Vampire Over London: Bela Lugosi in Britain," which deals with Lugosi's last major stint as Count Dracula on the stage. 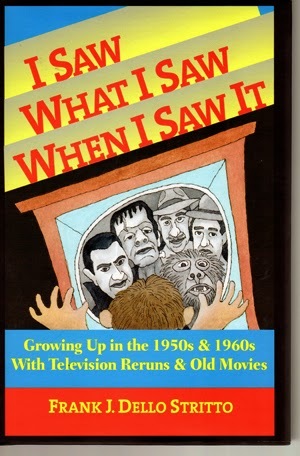 This interview accompanies a review of Dello Stritto's new memoir, "I Saw What I Saw When I Saw It: Growing Up in the 1950s & 1960s with Television Reruns and Old Movies," published by Cult Movies Press, who also are the publishers of his other books. I am also reviewing his memoir for my newspaper, The Standard-Examiner, and will include a link to the review when it is published. Here is the link. 1) You mention that the classic Universal horrors that you love so much do not scare you. Why is that so, in your opinion? Dello Stritto: If I had seen "Dracula" at age 4 or 6, it might have scared me, esspecially if I saw it in a dark theatre. I did not see Universal horrors until my late pre-teens/early teens, and on television. Too old for the kind of visceral fear that I felt seeing "War of the Worlds" (at age 3, in a theatre). "Scary" was never a factor in my watching the Universal horrors. I sensed early on that I was watching a mythology unfold, that I was discovering sagas that thrived just before my birth. I discovered a lot of multi-film series on afternoon television--the Johnny Weissmuller Tarzans, the Basil Rathbone Sherlock Holmes. But the Universal Horrors were true sagas, continuing stories across many films. They captivated, and I had to see them all. 2) Do you think children today are capable of the same type of fear that you got from War of the Worlds and Flash Gordon as a young child? Or has current technological advances, in real life and film, dulled our senses or imagination? Dello Stritto: Technology has nothing to do with it. Babies still cry, and children are still afraid of the dark. The first fears --loss of parent, loss of home, loss of safety -- are as potent as ever. A movie that taps those fears, or taps memories of them, can still get to viewers, young and old. I don't think the Universal Horrors tap those fear, though. At least not for me. They tapped a curiosity about a fantastic past that I found irresistible. 3) You wrote a memoir on your love of cult films and cult TV and your efforts to learn more about these youthful attractions as an adult. What is the spell that these films have over baby boomers that produce the scholarship, magazines, as well as kitsch that is published today? Dello Stritto: I don't think anyone really sheds what fascinated them in their youth. Rather like the power that first loves hold over some of us. For some reason, my generation hangs on to the entertainments of their youth longer and more strongly then most. Maybe because we were raised in an era of affluence, but raised by parents who were children of depression and war. Possessions were few and dear to them, and became many and just as dear to us. I am not boasting or confessing, but television was my best and most reliable friend when I was young. It was a good friend -- it never let me down, and though life took me in many directions, I never forgot my debt to it. Do people -- young or otherwise -- need myths? If so, I found mine in the films and TV that I write about. 4) What is a chief difference between Bela Lugosi and Boris Karloff in their legacy today. Most people I talk to say that while Karloff made more money than Lugosi, the latter easily outshines him in leaving a legacy in the genre. If you agree, why? Dello Stritto: Their legacy is their films. Karloff made better career choices, had better luck, and so made more good movies, gave more solid performances. I doubt his Frankenstein's Monster will ever be equaled. Lugosi's output is erratic, but at his best, no one can match him. His characters seem almost otherworldly. An almost obligatory scene in his movies has other characters discussing how other he is. Odd, but real -- believable perhaps because Lugosi made them real and unearthly at the same time. Karloff's characters move us because we can relate to them. Lugosi's great performances make us step back in awe. I can count those great performances on my fingers. Most of Lugosi's films are pretty bad. He shares some of the blame, but I wish that he had had better luck and better sense so that we could have many more fine performances. Karloff's legacy rests on a fine body of work; Lugosi's rests on a unique persona that shined all too rarely. 5) I'm about 10 to 15 years younger than you. I can recall scrambling to watch an old Universal horror late at night but by adulthood, I had VHS to see films in order. Do you feel watching these series films in scattershot order as you grew to young adulthood provided a unique perspective in appreciating them, or was a barrier to fully appreciating the films? Dello Stritto: Before home video, I watched only the movies that television and theatres let me see. So, I saw the Universal Horrors in no particular order, at odd times, and at irregular frequencies. Three years separate my first and second viewings of "Son of Frankenstein," whereas I first saw "Bride of Frankenstein" three times on the same day. Watching the movies like that forced the viewer to piece them together for himself, and so required some thought and imagination -- especially since the continuity between them is not always so good. But I don't think that helps the appreciation of the films. Who would suggest that a miniseries' episodes should be watched in random order, or that a novel should be read out of sequence? The scholarship on old movies can be divided into pre- and post-home video, and the post-home video age definitely has the advantage. In film books written in the 1960s and 1970s, the authors--certainly knowledgable--often get the details wrong, because they are doing a lot from memory. Once we could play and replay a movie while we wrote about it, the quality of the books went way up. Future generations will never know the world that I knew -- only seeing what a small handful of TV stations choose to let us see. Straddling both worlds may give me a different perspective, but I don't think it gives me any advantage. Unless, you consider the thrill of opening the Sunday newspaper to the week's TV listings, and seeing that a long-awaited film is at last going to air. 6) Expound the shared experience of, as a young adult, heading to NYC to travel to a film festival or theater and see an old genre film that hadn't been in circulation for decades. Was there an electricity in the audience? Dello Stritto: I usually watched old movies on TV alone. As more and more old movies appeared, I knew that I was not alone--that other people somewhere out there were watching them too. So, when an old horror popped up at the revival theatres, people like me usually showed up, and made great audiences. All of us had been waiting years to see these movies, and you felt the excitement. I remember the audiences, around 1970, for single, separate showings of "Mystery of the Wax Museum" and "The Old Dark House" -- both at Lincoln Center in New York. Both are lighthearted horrors, and the audience laughed at the fun parts, and watched in awe at the horror parts. Their electricity was palpable. Some other long-missing horrors--like "Dr. Jekyll & Mr. Hyde," "Freaks," and "The Most Dangerous Game"-- turned up at revival theatres that played them continuously for maybe a week. That diluted the audiences, but they were still appreciative. I must say that I hesitate to go to the rare horror revivals in theatres today. There is always someone is the audience, or some group, who come only to laugh at and mock the film. They ruin the experience for everyone else. That didn't happen in the 1970s, when we were so glad that a missing horror had at last turned up. 7) Do you feel that the old scary movies, comedies, serials, etc., that you saw as a child enhanced your imagination as a youngster? Dello Stritto: Yes. At their best, they really exercised my sense of wonder and awe: the dead could rise, men could turn into animals, animals into men, weird creatures lived just over the horizon, and scientists pursed crazy quests. I thought about my own crazy quests. Personally, I liked science fiction movies, but never dreamed of travelling to other planets or travelling through time. I would much rather have met a mad doctor or a werewolf. 8) You talk about efforts to gather original information about Bela Lugosi and you and Andi Brooks basically destroyed a negative myth with your "Vampire Over London - Bela Lugosi in Britain." As a film historian, what's it feel like to unearth a nugget, or hug chunk, of information that has not surfaced in scholarship yet? Dello Stritto: Take a great historical figure -- Washington or Lincoln, Napoleon or Caesar -- and imagine that somehow historians had overlooked a year in his life. That's the thrill that Andi and I felt when we started getting into Lugosi's 8 months in Britain in 1951. The Lugosi biographies at the time basically said that he went to England in 1951, did not do much and came home months later. I knew that could not be true, because Lugosi spent money freely. He could not live months without some income. So, when Andi and I joined forces, we set out to document what he had done. 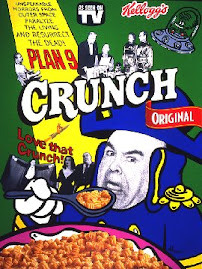 We envisioned a magazine article, but we kept finding people that worked with, or knew Lugosi while we was in Britain. We still are--we are now preparing an updated edition of "Vampire Over London - Bela Lugosi in Britain," which will include new reminisces that we have uncovered. So, what began as an article grew into a book. What began as a documentation project took on a theme: the great man's last hurrah, last grasp at a comeback. Researching the book -- as we started finding so much information -- was a great adventure. 9) As a youngster, you saw many trailers for films that you did not see for many more years. "The Fly" comes to mind. How often did a film that you waited to see for years meet the expectations of the trailer? Dello Stritto: Honestly, the raw fear that I felt watching some coming attractions has rarely been matched. The trailer for "The Fly" and for "Horror of Dracula" really terrified me. I guess I saw the movies themselves 10 years later. Of course, by then, I was older, had read a lot about them, and seen a lot of movies with pretty strong stuff. So, the films did not scare me at all. I won't say that I was letdown, but the "experience" did not match the coming attractions. In 1958, my older brother stayed up late to watch "Frankenstein Meets The Wolf Man" on "Shock Theatre." He told me all about the next day, and that was my real introduction to Universal Horrors. I wanted to see all these monsters. I had to wait 6 years before the movie came to TV when I could see it. Yes--I was disappointed, but how can any movie live up to 6 years--almost half my life--of adolescent imagination? I like the movie alot now, but that first viewing was a letdown. 10) Did the kids of the 1950s project a fear of World War III in some of the films in the theaters? Or were the films just scary on their own without the news headlines? Dello Stritto: My generation grew up knowing that the world could destroy itself, and we lived through the Cuban Missile Crisis, which brought us to the very brink. The brinksmanship lasted about a week or so, and I remember a constant sense of dread. Real pending doom. Still, I never walked into a movie theatre fearing WWIII, but often enough I walked out that way. There were schlocky movies like "Day the World Ended" and "World Without End" that had humans turned to monsters by radioactivity. "Radioactivity" was a really scary prospect for kids watching movies, since it made a lot of monsters. There were classy movies like "Fail Safe" which captured some of the feel of the Cuban Missile Crisis. WWIII and the apocalypse was the specialty of "The Twilight Zone." Some of its best episodes have ordinary people dealing with the coming war, or its aftermath. There is an episode called "The Shelter" which was really scary, even though all its characters are just simple people living in a suburb. A lot of these episodes aired before the Missile Crisis. So, for kids like me, our "background" for what was happening came from "The Twilight Zone." So, I don't think my generation projected a fear of WWIII on the movies and TV. Exactly the opposite -- the movies and TV exploited the themes. We learned about how WWIII might play out from them. Finally, it still astounds me that you prefer the 1938 A Christmas Carol to the 1951 version. Dello Stritto: I get that a lot. Those who like one version cannot fathom those who like the other. Young people do not appreciate that for a long time, those were the only two versions available. Now, there are many fine "Christmas Carol" movies out there, but a generation ago it was 1938 vs 1951. We can debate that -- but what's the point, no minds will be changed. You like one or the other, or wonder why anyone likes either. I try not to say what I think are the "greatest films" or the "best films." I prefer to say what are my favorite films are. The 1938 "Christmas Carol" is one of my favorites. I've seen it dozen of times, and will probably see dozens of times in the years to come. I just can't say that about the 1951 version. Hungry for a film? Buy now!